Recently, Asteroid 2007 TU24 has gained much media coverage. 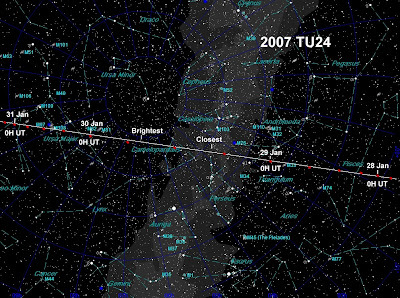 Asteroid 2007 TU24 was discovered on October 11th, 2007 by the Catalina Sky Survey. Size estimates indicate that it is between 150 and 600 meters (492-1,698 feet) in diameter. Asteroid 2007 TU24 will make its closest approach on January 29, 2008 at 08:33 UT. Contrary to popular opinion, Asteroid 2007 TU24 WILL NOT hit Earth. Its closest approach will be at a distance of 1.4 Lunar distances, or about 334,000 miles. A close miss, but a miss nonetheless. Image Courtesy and Property of: amateur astronomer Dr. Dale Ireland from Silverdale, WA. Asteroid 2007 TU24 will be visible to amateur astronomers in telescopes with apertures above three inches. It will have a magnitude of approximately 10.3, so it won't be visible with the naked-eye. The above image shows the asteroid's approximated path through the sky. Because of the asteroid's close proximity, however, parallax will become important in predicting its location. Parallax is the phenomenon that will cause the asteroid's apparent location to vary with your location on the surface. Visit the JPL Small Body Database for exact ephemeris for your location. I'll be looking for it if I've got clear skies. سارع الان بالتواصل مع فريق عمل صيانة جولدى الذي يوفر احدث الادوات الخاصه بصيانة جميع انواع الاجهزه الكهربائية المنزلية والتي يتم الاشراف علي صناعتها مجموعه من امهر الخبراء . I'd personally similar to for you to believe the previous commenters! My spouse and I come across this site genuinely a good choice for our unit undertaking. Currently click here payday loans oceanside I'm hoping to provide additional valuable blog posts after. This is the reason you ought to be careful about the ads that are oftentimes observed. In any case with reference to how edgy your circumstance might be, you will in any case need to set aside the opportunity to consider the greater part of your choices previously you choose the best strategy.